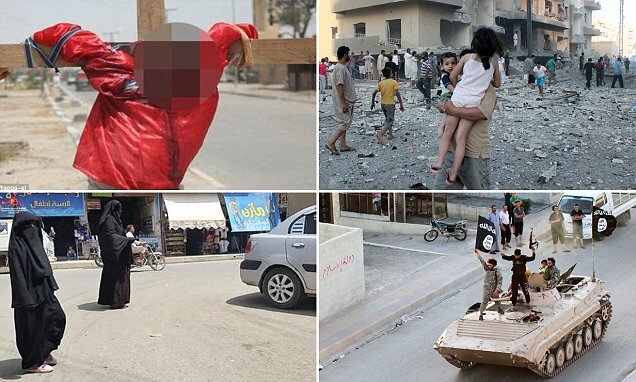 RAQQA SYRIA: ISLAMIC STATE CAPITAL IN RUINS BUT BEHEADINGS, CRUCIFIXIONS AND OTHER ISLAMIC HORRORS GO ON…… – The Tundra Tabloids……. Being bombed to smithereens hasn’t tempered their enthusiasm for all things Islamic. For those trapped in the ISIS capital Raqqa, life is a nightmare under the brutal regime’s draconian laws and people live in constant fear of air strikes (top right). For those whose homes have been bombed to rubble with no electricity or hot water, they are banned from working to afford simple luxuries like chocolate – and women and children are often seen lining the street for food handouts. Meanwhile, those who break ISIS’s (bottom right) laws are beheaded, lashed or crucified (top left), and homosexuals are thrown from the top of buildings. Locals live in constant fear of the terror group’s religious police, Hisbah, and its all female police force, the al Khansa brigade (bottom left), who weed out rebel spies, dole out beatings and force girls to become jihadi brides. But the city was once a place where children spent the summer with friends at pool parties, women wore what they wanted and students visited trendy coffee shops. Previous Post Previous Post SWEDISH POLICE INVESTIGATING ISLAMIC STATE THREAT NOTES MAILED THROUGHOUT THE COUNTRY……..
Next Post Next Post SWEDEN’S FM WALLSTRÖM’S KNICKERS IN A KNOT OVER ECJ’S RECOGNITION THAT W.SAHARA IS ILLEGALLY OCCUPIED……..